A solid, durable mini bike from the designers over at 3D Innovations, well known in the mini bike market for designing and building the highest of quality mini bikes, the DeskCycle being one of them. 3D Innovations also released the MagneTrainer but what makes the MagneTrainer a little different from their very popular DeskCycle is the height. The MagneTrainer ER Mini exercise bike is quite tall for a mini exerciser, with a height of around 15″ the chances of using this bike under a desk are minimal. But the Magnetrainer wasn’t necessarily designed to be used under a desk, this excellent mini pedal bike was purposefully designed for home use, therapy clinics, and rehabilitation centers. If you have been after a top of the range mini bike for home use, then this excellent piece of home cardio equipment may be just what you are looking for. One of the main reasons you might want to buy a mini bike is to burn calories, but we need to remember, a mini bike will not offer the resistance levels of larger stationary exercise bikes. What MagneTrainer does offer is 8 resistance levels and there are some pretty tough ones ( level 7-8). Once you’ve got used to using the mini bike and start to pedal at the higher levels you will see the MagneTrainer certainly can offer up enough resistance to burn away unwanted calories. It has been proven that cycling on a mini bike at a medium pace will burn around 110 calories an hour, put into context that’s the same as going for a one-mile walk. If you use the mini bike for 10 hours a week that’s a 1000 calories burnt, and you can do all of this sat in the comfort of your armchair in front of the TV. Generally, the weight of a mini bike should give us a good clue to the overall quality of the machine, and the MagneTrainer is heavy, one of the heaviest on the market right now, weighing 23lb. A heavy mini bike does have its advantages, the weight will really help with stability, aiding the bike in staying upright and stopping it slipping around too much. The extra weight will also have its disadvantages and may put some of the seniors off from buying the mini bike, 23lb can be quite heavy even for young users especially if you want to move it from room to room or carry it up and down the stairs. Although this mini bike is quite heavy, it’s nowhere near as heavy or as bulky as a regular exercise bike, the mini bike will take up considerably less room making it much easier to store and use. Personally I’d always chose a heavier machine, stability is of utmost importance when buying a mini bike, the last thing you need is for the bike to topple or slip when in use. And what’s also great about the MagneTrainer’s design is the 15″ wide feet, excellent for helping with stability and some of the widest stabilizers we have seen on any mini bike. Let’s not forget this mini bike also has rubber capped anti-slip feet, making the MagneTrainer one of the most stable bikes available. What we tend to see with a lot of cheaper mini bikes, is a lack of resistance levels, there’s no point buying a mini bike which only offers you a couple of resistance levels. The 8 levels offered by the MagneTrainer will allow you to set yourself goals, as you progress you can move on to the next level, 1-being the easiest 8 the hardest, a large number of resistance levels is what I would expect from a machine priced at this point. If you’re going to pay this amount of money for a mini bike it must allow growth for you the user, and with 8 resistance settings, there is enough here to challenge most users from beginners to the advanced. You’ll gradually tone your muscles and burn more calories the higher the resistance. The DeskCycle has been measured at 45db, the DeskCycle uses the same magnetic resistance system as its older brother the MagneTrainer making both bikes very smooth and quiet to pedal. Great if you plan on using the bike around other people watching TV, or working, both bikes are quiet enough not to distract the person next to you. The MagneTrainer ER mini exercise bike comes with a large LCD display, which can prove very helpful if you want to keep an eye on the speed you are cycling, the display will also give you a rough estimate on calories burnt, distance traveled and time cycled. The MagneTrainer is definitely one of best mini bikes available for home and commercial use, the mini bike offers a stable versatile way to exercise from the comfort of your home whether it be watching TV, reading a book or working at your PC, we’re sure you will not be disappointed with your purchase. Remember this mini bike can be used for an upper workout too, just simply place it on a desk or table and use your arms to pedal the exerciser. 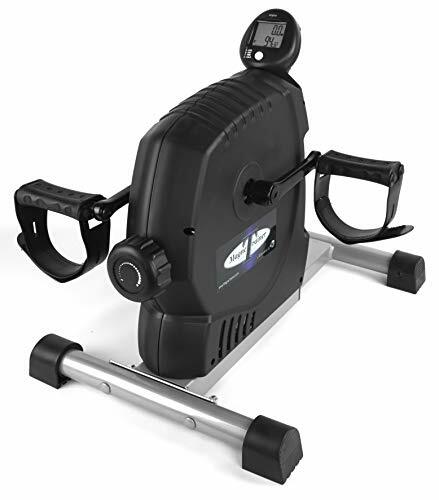 A great all-round capable pedal exerciser from 3D Innovations. For our alternative choice, I thought we would take a quick look at the DeskCycle, this is another excellent bike from 3D Innovations and it’s well worth a mention especially for people seeking a mini bike a little lower in height. 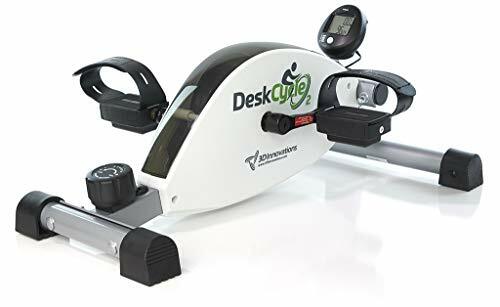 The king of under desk mini bikes, the DeskCycle, a mini bike that has the same excellent build quality as the MagneTrainer but has been designed with the purpose of being fully usable in your workplace. The low-profile 10″ design makes this fantastic pedal exerciser perfect for use under most desks, even desks as low as 27″. It is also a very stable mini bike, firstly because of the weight, 24lb, and most importantly because of its low profile design it is much less likely to topple when in use. The bike has wide stabilizing feet capped with anti-slip rubber, perfect to stop the bike slipping on hard floors. The DeskCycle also includes the versatile 8 resistance levels, plus it can be used on both floor and on top of a desk for upper body workout. Although the DeskCycle has been designed primarily to be used at work, it is perfect for home use and offers the same useful features as the MagneTrainer. If you are after a mini bike for both home and work then there is no better than the DeskCycle. Lastly, it’s worth noting there is a DeskCycle 1 and DeskCycle 2, the only important difference between the two is that the DeskCycle 2 has an adjustable pedal height allowing to go as low as 9″. Summary A top of the range mini exercise bike at a reasonable price, The MagneTrainer will help people to lose calories, and tone arm and leg muscles with its versatile 8 resistance levels. If you have been looking for a durable well built mini bike for home, well, they don't come much better than 3D Innovations MagneTrainer.